What is my success story for using the law of attraction to manifest a specific person? Rarely does a day go by that I don’t receive an email or blog comment from a reader asking me how to use the Law of Attraction for a specific person. I understand the pain they’re going through, but I also know that you can use the Law of Attraction to attract a specific person. I know it because I’ve done it. Why did everyone say that when it comes to love, there’s a limit? Then one day I read a story by Neville Goddard in which he mentioned how he successfully manifested a specific person. He also told the tale of a woman he knew who did the same thing. 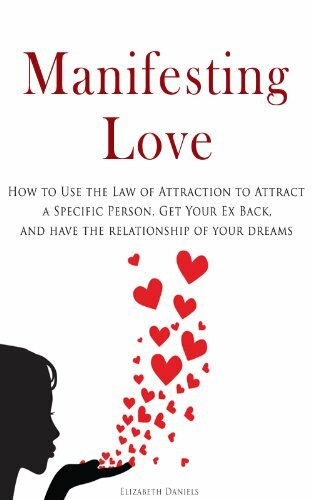 It gave me hope and set me on the path of figuring out how to use the Law of Attraction to attract a specific person myself. But I didn’t do it just once. I did it over and over again. Why? Well, you know how sometimes what you think you want isn’t what you really want? That’s what happened to me. 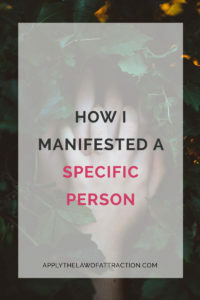 The first person I manifested wasn’t what I wanted. When I realized that, I wanted to attract someone else, but this time I really wanted to test what I did and see how well it worked. I didn’t just try to attract someone I was interested in romantically, but I tried it over and over again on random people – people I went to school with…people I worked with…people I would see while out with friends. I even tested myself…or rather the Law of Attraction…to see if I could pre-determine how they would contact me or how things would go once they did – would it become a great relationship, a friendship, and so on. Friends were amazed at the luck I had. They had me show them how to do it, and it worked for them too. Finally, I decided to try it on the person I knew was my soulmate, Edward. We had been friends for years, but I was never ready for more than friendship. Over time, we ended up living in different countries, keeping in touch on birthdays and such. But now, I was ready for more than friendship. I wanted the happily ever after. Many people might have said the obstacles were too great; I shouldn’t even bother trying. I knew the only limit to the Law of Attraction was my beliefs…and I believed…no, I knew…I could attract him just as easily as I attracted all the other specific people I had set my eye on. I was right! Within three weeks of focusing on manifesting him, Edward sought me out. Our lives changed so that we could be together, with all obstacles falling away as if the Universe had its hand in making it happen, which of course it did. We’ve been together ever since. I understand why people want to attract a specific person with the Law of Attraction. I know the emotions that are involved. I know the curiosity and the desire. Most importantly, I know how to make it happen. 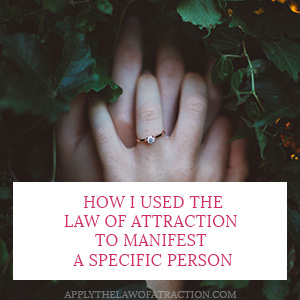 I’ve received so many questions from readers about how to use the Law of Attraction for love for a specific person that I’ve set down and written my full system out. I’ll tell you how you can get it in a moment. I’ve spent months writing everything down, testing it to make sure I hadn’t left any detail out. When I was done, I was surprised to find out that I had written a book. It’s far too much information to put on this website. That’s why I’ve made it available on Amazon as a kindle book. Click here to get Manifesting Love: How to Use the Law of Attraction to Attract a Specific Person, Get Your Ex Back, and Have the Relationship of Your Dreams. You DON’T need a kindle to read it. You can download a free app here to read it on a PC, Mac, iPhone, iPad, Android, Blackberry, and more. What Happens When Two People Want to Manifest the Same Thing? Your words now give me Hope in saving my Relationship with the Love of my life. We have been separated from each others by others factors like Demographic, familial etc. I’m glad I was able to give you hope. It is possible to manifest a specific person. I’ve done it and others have done it. The Law of Attraction always works if you let it. I bought your book on march 2. on march 10 he contacted me, i was shaking in disbelief, i was in utter shock. prior to this he had no spoken to me in 6 weeks, i would have given anything in the world to see this person again, detachment wasn’t it easy and i am still working on that, a part of me knows that obviously i will be ok regardless of the outcome.i was familiar with loa and materials things were always easy to manifest because i was never really attached to them. in conjunction with your suggestions i wore a necklace he gave me and sent him balls of loving energy, i do this through hypnosis. i have known this person for 7 years and have a deep bond with them and knew he would pick up on something. i also take bad memories and imagine i am throwing them in a dumpster. i also have been scripting “create your days”everyday. i love to help people and hope to give more people hope. hugs for you 🙂 thank you for your book. That’s fantastic D.L.! Detachment can be challenging, but it seems like you’re on a really good path with it and the Law of Attraction. Your idea of throwing bad memories in a dumpster is a really good one. I think I’ll try that one out too 🙂 Thanks so much for sharing your success with me! Hi, I ‘ve just recently bought your book and have put into practice all of your suggestions to attract this guy I find really attractive who works on a local department store. I’m a gay man and my only reservation is that this guy is not gay. However I have received positive eye contact, smiles etc. but also don’t want to have to keep walking through the store just to see him, in casein come across as a stalker. So i ‘ve used the phrase ‘this or something better’ to cover this. Is this sufficient or do you suggest anything else?? Hi B, That is a good phrase to use. Also, you don’t need to worry about creating opportunities for the two of you to meet by walking through the store. The Law of Attraction will take care of that. You might find that you run into each other in other places and such. But if you want to walk through for just to see him and have a brighter day, by all means, enjoy a walk through! Thanks very much for resply and I really liked your book. It’s very practical and not full of waffle . Walking through the store can be a ‘mixed bag’ – if I walk through and get a big smile then it dies brighten my day, but in the other hand if get blanked then it can have the opposite effect . I think I’ll walk through only when I need to, then I won’t feel like I’m forcing things. Thanks B! Great approach to walking through the store. It’s also a great sign that you recognize the effects of doing so! Hi Nat, You can manifest a relationship again. Anything is possible with the Law of Attraction. Instead of focusing on whether or not he is with you or will come back, do things that make you happy. Enjoy yourself! Whenever your thoughts of fear come up, release them and shift to thoughts that feel better, even if it’s just a little bit better. Keep at it and before you know it the fear will be gone. Your thoughts will be about how happy the two of you are together and how great things are. Keep working on shifting your vibration to a better feeling place. Do your visualizations. You can create the future you want! Thank you for the encouragement Elizabeth. I already feel lifted from your response. I believe I am receiving. Are even the smallest signs the universe telling you on its way and confirming it is what you actually want? You’re welcome Nat! And yes, even the smallest signs tell you it’s on its way. I have always heard that you shouldn’t try to manifest a specific person but allow the Universe to send the best person for you. Do you think that focusing on a specific person (who may be wrong for you) could prevent you from meeting your soulmate? Hi Fayola, That’s a great question! With the Law of Attraction, your beliefs create the Universe around you. Every person, every thing, it’s all created by you, even your soulmate. I don’t believe that focusing on a specific person can prevent you from meeting your soulmate. I believe the specific person can be your soulmate. The key is knowing how to use the Law of Attraction to create the kind of relationship you want to have with the specific person. I’m in love with this man that I’ve been in an on & off relationship now for about 7 years. Initially, he pursued me, but once I gave in and liked him too, he immediately backed off with the excuse “I don’t want a relationship”. He has never told me he is in love with me but I know that we have a connection that has survived both of us dating other people at different times, and I know and feel that this is the man I should be with. About 9 months ago, he moved away with his current girlfriend to a town about 5 hours away. He soon broke up with her, and came back to me briefly and then returned to her. Now he is moving clear across the country, and I have no idea if this will still work for me (LOA). I’ve been trying very hard, but since he returned to his girlfriend, its like our connection is really off. I bought your book, and read it, but I’m wondering how to make it work in my case, where I love him, but I can’t deny our connection has definitely weakened ( I hardly hear from him at all in the last 3 months), and even I have a hard time recreating that feeling when I’m trying to visualize us back together. However, I really love him and am really hurting that we’re not together anymore. Can you help me? You don’t have to change the techniques in the book. Just follow them and they’ll work for your situation. However, be sure to clear up your thoughts, such as “our connection has definitely weakened” and “we’re not together anymore.” Every time you say or think those things, you’re creating more of them. They’re a direct counter-intention to what you desire, and if you give them energy, your will manifest your counter-intentions, not what you desire. Thanks for responding. I guess the part I’m really struggling with here is resistance. We’ve had so much history of things not working out, that I think that deep down I try very hard to visualize and keep positive, but subconsciously I keep defeating myself. Do you have any recommendations for me, on how to fix that? Specifically in this situation with a relationship that has had its challenges? Try rereading chapters 3, 7, 8 and 9. They provide a lot of key tips and exercises to help you shift your energy so that you don’t continue to defeat yourself. EFT can help you release any resistance that might be coming up due to past problems. You can learn it for free at The Tapping Solution. Thanks Elizabeth, I’ll definitely check out the EFT too… I think I did look into it before but was trying to figure out what area was good for me. By the way, do you offer any phone or in person sessions? If so, where could I find that information? I’m not offering coaching at this time, but I can add you to the notification list for when I start offering it again. Thanks Elizabeth, Please add me to your notification list. In the meantime, do you think its possible if you could write an article or something more in depth of how you used your techniques in your real life situation with your loved one? Sorry for the delay in replying – I’ve been out of town. I explain in my book everything I did. Nothing was left out. I don’t know what else I could add. Hi there! I am currently attracting a specific person into my life with the help of your wonderful book. I was wondering if it was okay to create multiple visualizations? I created one visualization that I have used for a few days now, but I thought of an even better one that I think I’d minimally like to use alongside my original one. I was just wondering if this would interfere with the process or cause a lag in time…thanks and I adore you! Hi Elizabeth I have purchased your book. I have a specific man in mind. But since childhood I have lesbian tendency and want to get rid off and manifest this man’s love. Please help me. and cud u please leme knw the book name so dat i can get it ,,or if any one cud help me please??.. Hey, Elizabeth….do you think it’s possible to attract another boyfriend if I already have one? The reason I’m asking this is because my friends are telling me I can’t until I let him go…..is this true? Hi Elizabeth, Very good book! was wondering if seeing and hearing that specific person’s everywhere is a sign the universe is going to bring us together, or am I just seeing the name because she always on my mind. I haven’t seen her in like a year, but I still see little signs here and there. Also, I’ve read a few books by Neville Goddard and he says not be concerned with signs/outer world. Was just hoping you clear up the confusion I’ve been having. I really do appreciate all you do on this subject that seems so complicated. I’ve been trying to buy your book Manifesting Love on amazon.Even though I have an kindle app and an amazon account it says this tittle is not available for purchase.I’m from Turkey and I’m really looking forward reading your book.May you help me? Please contact Amazon customer support for help placing an order through Amazon.